So the wife decided it was time I got a present. She bought me a new gas grill. The Charmglow 810-7420-S 4 burner grill was delivered the other day. Now my old grill was in a sorry state. The burners has basically rusted apart and when I dissembled it, they fell away into dust. My grilling of course was just horrible because the flame setup was just all over the place and there was no even heating. We were looking over grills for the last couple months and I saw this Charmglow at the Home Depot website. The grill is only available through them. What I liked about it is that it had a double hood (see pic below). Each hood covers two burners. This means that you do not need to light all the burners if your just cooking up say, a London broil. This can really save on propane when you are cooking. Another plus is that you can cook two different things on the grill at different temperatures. Each hood has a separate temperature gauge so you can monitor the heat. I am a bit skeptical about the gauges themselves and am going to test them against a thermometer soon. When I first fired it up, they heated so quickly, I found it a bit hard to believe. They were basically at 700 degrees in about five minutes. Most of my grills have been cheap little things that you don’t expect more than a year or two from. For this reason, I should be excused at really falling in love with the electronic lighter. 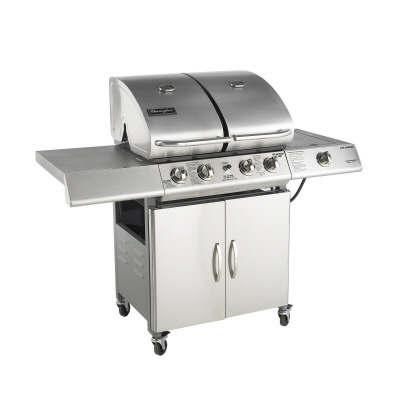 All of my grills had the igniter button that would click once, and rarely light the grill and quickly break. The Charmglow uses a double A battery on it’s igniter and fires up the grill immediately. I just love the fact that I do not have to use a gas lighter anymore, taking my life in my hands, to light the grill. The hood and doors are stainless steel. The grill plates are cast iron covered with porcelain. Preferably, I would have wanted stainless steel plates, but they were not available at the time. The unit comes with four locking casters and they are very sturdy. In fact, the entire unit is quite hardy. It is not a light grill. It took two of us to move it up to the porch and I have moved more than my fair share of furniture in my life. There are two drip pans built into the unit. A large one underneath the four burners that collects grease, and it angles down to a hole where it pours into a second smaller pan. At first glance I thought it odd they would do this since it means cleaning two pans instead of one, but after seeing it in action it made sense. You would not want that much grease sitting right under the burners. One strong wind gust could ignite a full tray creating a nasty flare up. The unit did not come with a built in smoke box, but I was able to take a small metal loaf pan filled with soaked chips and place it under the grill plates which worked just as good. My wife also picked up a rotisserie kit for the grill. The unit comes with pre-drilled holes for standard rotisserie kits and after a bit of tinkering, it went in just fine. I have yet to use it, so I cannot comment on it yet. The unit does come with removable warming grill racks that sit above the main grill plates. When using the rotisserie, you have to take these out. I never liked warming racks anyway so I probably will never use them. The space behind the doors holds the propane tank. The tank sits firmly in a hole cut out just for the tank. There still is some room to the left of the tank for anything else (that’s where I put the warming racks). As for assembly, I cannot tell you much. The wife paid extra to have it assembled in the store and I thank her for that. I hate putting them together! After we got the grill set up, I decided to make some of my barbecued chicken that night. After using my old grill, I found that I had to relearn how to grill a bit. I was not used to the great heating uniformity this unit has. I “crisped” up the chicken a little too much, but quickly got it under control. Except for that issue, the chicken came out great. The next night I cooked up a London broil and it came out very good. I used the side burner to cook up some green and wax beans. It worked perfectly. One thing I noticed is that the wind did not affect this grill like it did my other ones. The wind was really blowing when I made the steak but the heating was still top notch. With the caveat that this is probably the most expensive grill I have ever owned, I have to say that right now, it is the best grill I have ever had. Now I have only had the grill for less than a week so this could change. I will post back here any new findings should it warrant.